Top, Secretary Mary E. Peters, left, and Secretary James H. Burnley. Bottom, Secretary Samuel K. Skinner, left, and Secretary Rodney E. Slater. 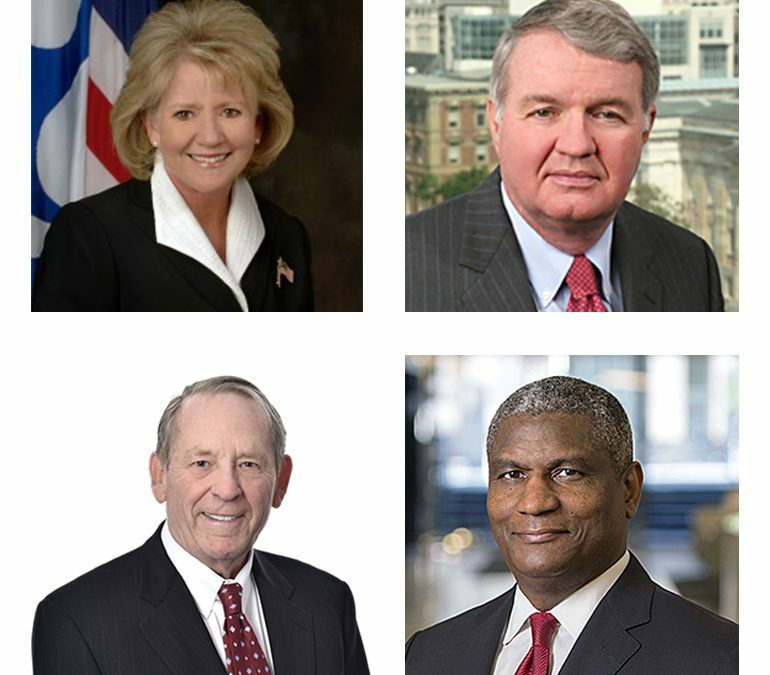 A special opening panel at the 30th Annual Public-Private Partnerships in Transportation Conference, July 18-20 in our Nation’s Capital, will feature four former U.S. Department of Transportation (U.S. DOT) secretaries who have held the job since ARTBA created the event in 1989. They will reflect on advancements in P3s during their tenure, as well as provide a behind-the-scenes look at federal transportation policymaking through the years. Secretary James H. Burnley IV (1987-89) – During the Reagan administration, he established early policies to encourage more private sector participation in meeting transportation infrastructure needs, and continues as a preeminent legal advocate in the field. Secretary Samuel K. Skinner (1989-91) – Serving under President George H. W. Bush, he worked towards passage of the Intermodal Surface Transportation Efficiency Act (ISTEA), which expanded use of P3s and made new toll highways eligible for federal-aid funds. Secretary Rodney E. Slater (1997-2001) – During his tenure at U.S. DOT, President Bill Clinton signed the Transportation Equity Act for the 21st Century (TEA-21), which authorized pilot tolling programs and solidified P3-related programs like the Transportation Infrastructure Finance & Innovation Act (TIFIA) and state infrastructure banks. Secretary Mary E. Peters (2006-09) – Nominated by President George W. Bush, she utilized the department’s discretionary grant programs to encourage use of congestion pricing methods and is known as a steadfast advocate for P3 development. Jennifer Aument of Transurban, first vice president of ARTBA’s P3 Division Board of Directors, will moderate. An updated agenda and other details of the 30th annual Conference are available on the P3 website. Be sure to register now.